Are we cooling the planet with SO2? Today I am going to ask a provocative question. Are we cooling the planet with Sulfur Dioxide (SO2)? Cooling you might say? I thought we were warming? It could be that we are keeping the planet 4C cooler than it would have been (and still appear to be warming). 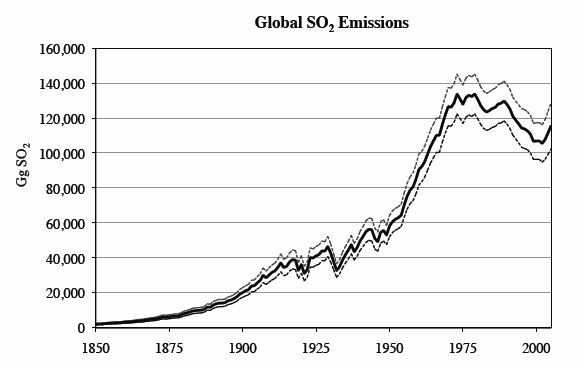 From 1850 to 1980 SO2 emissions rose from almost 0 to 140,000 Gigagrams per year in 1980 and then dropped down to 110,000 Gigagrams around 2000 and then it started to rise again as China began to burn a lot more coal. Pinatubo released 20 million metric tons of SO2 into the atmosphere. 20 million metric tons = 20,000 Gigagrams. Therefore, around 1980, humans were releasing the equivalent of 7 Pinatubo’s worth of SO2 each year into the atmosphere. Depending on which reference, the cooling of one Pinatubo = .5F or .5C or even .6C. That would mean human produced SO2 should be cooling the earth by about 3.5C. Yet temperature went up over .5C from 1980 to 2000. Oh wait, SO2 went down from 1980 to 2000 the equivalent of one Pinatubo. Could it be that if there was no human SO2 in the atmosphere the temperature recovery from the Little Ice Age could have been as high as 4C instead of the .8C claimed? Maybe all that coal China is burning is saving our planet!